Bicycle Repair Forums - BikeRide › General (Non-Repair) Topics › Bicycle Culture › Show off your bike! › Hyper Havoc FS 26"
I know what you mean. I think the first real bike i ever owned I spent $600. That was the bike that got me hooked. I never looked back. Since that time, every other bike I own or have owned has 100% been paid for purely by the "sweat equity" or my time in other words, put into the bikes. Which for myself I consider my labor to be free. It is not so much about the money, it just helps me acquire what I want as far as bicycles I otherwise would never be able to afford. So I "Sing for my Supper" with bicycle labor. That's it. With bike you get what you pay for. Not bad for a $100 for a full suspension bike. If you are expecting more then this is not for you. You need to get a more expensive one. This bike has Shimano grip shifter and rear derailleur (cheaper Shimano version). It has a generic crankset and front derailleur. It has generic tyres/ tires, hubs and spokes and a generic fork. I made this as my project bike. The bike was given to me by my brother and decided to upgrade the parts one small step at a time. I upgraded everything except for the frame and fork. It has that same Hyper Havoc FS look but rides way better. Thank you. I mostly got used parts but in good condition from Ebay. The wheelset (rims, hubs, spokes, cassette and tires for $150 (includes shipping). The handlebar is $18, the stem is $20, The quill is $15, the bottom bracket is $20 (new). The chain is $11. The crankset is $38, front derailleur is $18 and The rear derailleur is $23. Spent a little over $300. If I was going for a more expensive bike and nicer bike it would cost me at least $700 up. I don't want to spend that much money in one day. Saw some nice looking bikes at local bike shop but the components are nice but on the cheaper branded side. I might end up replacing those components too. So I decided to get a Hyper Havoc. I love the color. I love the frame design and I love how it looks. It took me 5 months to get everything I wanted. Tools for removing the components are cheap too. I just have to buy the tools for the bottom bracket and crankset. I was going for a Sun Rhynolite wheel set. It comes with a Rhynolite rims, DT Swiss spokes and Shimano Deore hubs for $125/ pair. It is nice and really light. However, found a wheel set that consist of Araya RX7 rims with Shimano Deore DX hubs and skewers, DT spokes, Shimano 7-speed cassette with Michelin wheels (France) for $150/ pair. It has few scratches but not a big deal. I love how it rides now. My bike runs smooth with no noise. Fine job! Thanks for the info. The best part is I bet you had fun doing it too. I love taking bikes and making them my own. (04-13-2015, 10:48 PM)painkiller Wrote: Fine job! Thanks for the info. The best part is I bet you had fun doing it too. I love taking bikes and making them my own. Thank you. I agree with you. I don't really know how to replace some of the parts. Forums such as this and YouTube videos make it much easier. I had a hard time looking for the correct parts and did tons of research. If you have plans of upgrading your bike and have questions on what size to get you can message me anytime. and you probably had more fun. sounds to me like you could buy a high end bike frame now and build any bike you want. (06-23-2013, 01:18 PM)cambridge111 Wrote: Newbie to bicycles in 30 years. Purchased at Walmart less than one month ago. Like it but the FALCON cassette already slipping. Just ordered socket to take off and checkout. Will a Shimano cassette fit? I think this is Freewheel and wonder if a better brand like Shimano will fit on wheel. I assume if (wheel)threaded they are all one size like the lightbulbs. New experience and little by like will be acquainted again with bikes. Shimano threaded freewheel would fit as long as it is 7-speed. Shimano cassette would fit as long as it is 7-speed. A Shimano 7 speed FREEWHEEL will fit; a Shimano 7 speed CASSETTE will not fit. Falcon does not offer cassettes, they only offer freewheels. I have better experience with Sunrace 7 speed freewheels than with Shimano 7 speed freewheels. On the flip side, I have not had good experience with Sunrace cassettes (8 & 9 speed), but have had good experience with Shimano cassettes (7, 8 & 9 speed). Sorry for the confusion. I was thinking of cassettes when I replied to his question. You are definitely right. I mean if you have a threaded hub then a freewheel sprocket would fit. And if you have a spline hub then a cassette would fit as long as it is 7-speed. If you have an 8 speed hub a spacer is needed to fit a 7-speed. (06-05-2014, 02:55 PM)mudkicker78 Wrote: I have already started changing this bike from cheap to not to shabby with new rims/drivetrain. Going mostly Shimano. * Shimano Alivio M11 28-38-48T HyperDrive crankset w/ Matching top pull front derailleur. This bike rides nice and smooth. The rims made the biggest change in how hard pedaling is and the change in the drivetrain smoothed it all out. The Country Rock tires reduced rolling resistance and with 70LBS. of pressure has made yet again, the second biggest difference in both handling and pedaling. Not quite bike shop quality considering the front fork shocks moves to easy. As of right now there were no special modifications as changing forks, But I am doing research and intend on pulling the front fork off to verify the I.D. of the head tube to be 1". This will be awesome if it is since I found http://www.genuinebicycleproducts.com/ which makes a custom headset that allows you to change older and cheaper bikes with a 1" head tube to a 1-1/8" threadless fork. BTW to anyone that says it cannot be done. Looking at my Quill Stem Adapter the 1-1/8" head is smaller then my head tube. This will be the most costly upgrade to my bike with forks costing as much as the bike. Since I already got the Quill Stem Adapter to run a threadless stem. All I will need is the headset and the new fork. 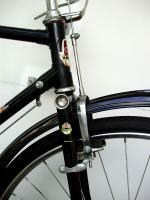 The bike has an .833 inch (21.15mm) stem diameter, commonly for old bikes and department store bikes. Do you think it is possible to use a fork with an inch stem? If it is possible. What size headset that would work. Would a threadless fork and threadless headset could be an option too? Like you, I made this as my project bike too. I pretty much upgraded everything except for the frame, fork and headset. I got an inch quill adaptor, a 1 1/8 stem and a 31.8 handlebar. Thinking that an inch quill would work but I just found out that 22.2mm quill would not fit as the bike has an .833 inch stem diameter. Went online and the next size quill I found was 21.15. I am assuming that 21.5mm would work.